BE CAREFUL, THIS PAGE IS ONLY HERE FROM OUR VERY VERY OLD ARCHIVES, FOR KEEPING URL REFERENCES. WE CANNOT PROVIDE ANY SUPPORT ABOUT IT. THIS DEVICE ISN’T FOR BUYING. protodeck first demo 2010 from Julien Bayle on Vimeo. The problem is easy to understand: I wanted to drop my PC keyboard + mouse during live performance in order to be focused on music/sound/live. The only way to solve my problem was to use an hardware to control Ableton Live, but not only that, I need a feedback from it too. I need a big hardware without multifunctional knobs, sub-menu you have to choose to change the function of this button etc etc : I need to have ALL under my eyes and I need that EVERYTIME. I looked for the perfect controller, but I didn’t find it. only monochrome stuff or 2/3 colors leds, only few pots with a billion of sub-sub-menu to change encoders function etc. So, I guess … I have to think, read, code, test, build, learn to solder better… to create my OWN hardware. As a lot of thing I build/create, I find a name before to begin anything. A name is important. A name gives you a target. It makes the things more concrete so, the name is: the PROTODECK. Those who thinks about the so powerful MONODECK II built by Robert Henke by discovering the name could be … right. By the way, a lot of deck are named like that. But it could be a pretty tribute to Robert, even if he wouldn’t be moved by that. By the way (bis), he congratulates me about the hardware. And I was happy about that !!! I have to thanks a lot of people which helped me A LOT ; without you, this story wouldn’t have been possible! – Tim/smashTV :: the guy who makes the very best/reliablest/cheapest midibox modules in the world! and obviously, Thorsten Klose, the great midibox creator and guru! A special thank to Ralf Suckow from Ableton company, for his help, ideas, and experiences. I chose the midibox framework because it is VERY reliable, well documented, it contains a lot of skillful people that contributes to make it evolving. It could be useful to begin here in order to understand well the purpose. – The software part is a bootloader + MIOS + my application. A nice schematic here to understand how all these layers go! There are differents parts which have to be quoted here, even if the read of previous link will give better explanation. The CORE is the brain. It contains the PIC and all stuff it needs (quartz, midi ports, voltage regulation, etc). CORE also provides all the input and output for modules connection. The AIN is a module used when you want to “read a lot of analog voltage”. It can be said differently: if you need more than 8 potentiometers/flex sensors or any other analog sensor, you need it. The DIN is a module used to read digital input. Basically, it can be used with switches and buttons. You push the button, it reads a value, you release it, it reads another one. It can be chained too and gives 32, 64 or more digital input. The DOUT is a module provide digital outputs. It feeds with current or not the devices connected to his pins. The most obvious use in my case was: led control. After, I’ll describe a big hack I had to do with the DOUT in order to drive my common anode rgb led matrixes. It involves transistor, resistor … a big fun! All these modules can be built by ourselves or bought as kits. I’d suggest you smashTV website (US). He actually makes the most reliable stuff.. I know what I mean, I tested the others!. He sells preburned PIC. One of the BIG advantages buying from Tim (smashTV) is the 2×5 pins standard connectors! For each thing, it is the same connector and it is very easy to find self-crimping 2×5 connector part! The protodeck’s code/firmware/apps runs on the core. There are a lot of applications already coded that we can inspire from. The principle about to use midibox as a human-machin interface is easy to understand. – you turn a potentiometer of the protodeck ? it sends midi control change message. – you push/release a button of the protodeck ? it sends a midi note on/off message. – you send a midi note message to the protodeck ? it light up a led. I need potentiometers, I need buttons and I need feedback from Ableton Live. The feedback is done by RGB LEDS. I decided to use potentiometers screwed on the frontpanel, and to build my own PCB for buttons & leds. Firstly, I design a layout that matches with my live set. The clip control matrix is used for clip control (!). It involves 64 buttons + 64 RGB leds. All song are 6 scenes. I can move a little window of 6 scenes with the 2 buttons on the left and the matrix is updated with the content of the live set. The track control is used for controlling each 8 tracks. 2 pots for send amount, 3 pots for instruments tweaking, 1 button for changing modes or activate a specific FX and the volume pot. The first track is the main drums track. This drum track is divided in 6 parts controlled by drum control. The drum control is used for controlling drum tracks. 2 pots for sound tweaking, 1 button for mute each drum part. The master control is used for master eq and 2 FX racks tweaking. It contains a master volume pot. The LCD will be involved in this multipurpose way: it could give a feedback of master volume, showing some important informations like the weather of the next day etc. Let’s go inside protodeck’s guts! It involves 2 CORE, 3 AIN, 3 DIN, 2 hacked-DOUT, 1 LTC and 1 LCD screen. All pots, buttons and leds are handled by one modules. I named the modules in order to know which core handles it. Colors give informations about which module handles which part. Pots of the protodeck are all linear 10K-Ohms potentiometers. Linear is also named “B” type. Don’t use logarithmic (“A” type) potentiometers !! They are multiplexed with AIN modules that involve analog multiplexers (4051). I suggest you, at this point, to read about multiplexer and multiplexing. But basically, I can say multiplexing is a process where multiple analog message signals or digital data streams are combined into one signal over a shared medium (taken from wikipedia). Each AIN can read 32 values and only uses 4 channel. Said differently, 32 pots can be connected to one AIN and only 4 Analog input are used on the core side. It saves analog input. In the midibox world, pots have only to be fed by 5V/GND and connected to one input of one multiplexer of one AIN. Considering I feed 5v and GND with a star-wiring mode, there is only one wire from each pot to AIN. BE CAREFUL : all analog input not connected HAVE TO BE connected to the GND ! Buttons of the protodeck are basic SPNO switches (SPNO= Single Pole, Normally Open). It means if you do nothing, the circuit are open, if you push it, the circuit is closed and current rides away. They are multiplexed with DIN modules that involve digital shift-register(SR) (74HC165). I suggest you, at this point, to read about shift register. Basically, here, in that case, they are said Parallel-IN Serial-OUT: each 8-bit shift-register can read 8 digital input and give the result on 1 serial output. Each DIN can read 32 values because it involves 4 SR.
With 3 pins involved in the serial communication between DIN & CORE, one DIN can read 32 digital input for the core for which it saves input too. I need RGB Leds like those common cathode or anode we can easily find. I ordered common cathode, they sent common anode, so I had to hack DOUT module… by the way, I would have to hack that for common cathode too (but a little bit less). This is the hardest part to figure out cause it involves … code too. I’ll describe the hardware principles here and in the next chapter, I’ll link it to code/software part. Basically, I needed 87 RGB LED. If I make a little basic calculation, I needed 87 * 4 pin = 348 pins to drive all the RGB LED. scary!!! The code will have to make a some cycle(s). I display one row at a time… but very quickly (the row cycling is 1000Hz = 1000 rows displayed per second etc etc). We’ll check that in the code further. ok. but what does this scary and evil schematic mean about how it goes ??? No problem, I’ll explain it. A RGB led is like 3 little leds in the same package. I’ll twist the word led further in order to be faster. So if I want to light the led of row 1 and column 2 (wrote (2,1)) and the led(1,2), I have to feed the row 1 & 2 with 5v & the column 1 & 2 to ground. If you followed me, you’d understand that not only led(1,2) & led(2,1) would light up………. but led(1,1) & led(2,2) too ! The principle is very easy to understand. You send bytes from CORE to DOUT, and the SR in DOUT drives his pin or not (= feed 5V to pins or not). Because the maximum current a 74HC595 SR can drive isn’t enough for a matrix as big as this, we have to use BC547 transistor. SR feed 5V to base of transistor. This one is saturated and close the circuit between collector and emitter, and let current be driven to row. So I send 1 to a particular pin of a particular SR, and 5v is available at the emitter of the corresponding transistor. right. I know how to “send” current to my matrix”. I’ll have to make a row cycling in order to avoid to light up all the led in a column when I only want one lighted up. 1st cycle: the row. Obviously, for closing the circuit, we have to provide a sink way to this current. 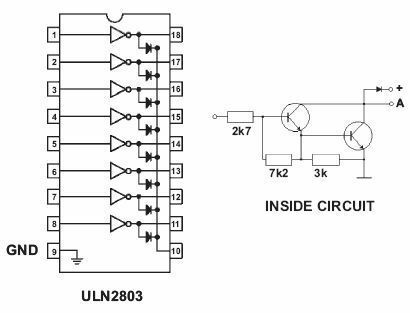 ULN28003 is a darlington array component. Basically, it is linked to ground with one pin (pin number 9) and got 8 input pins and 8 output pins. You send 5v to input pin N, it connects ouput pin N to ground. Easy to understand. It can be understood as “a kind of” inverter: you send current, it sinks current to ground. Connected to SR too, it is easy to control them. feed 5v to pin c of other SR as you want to light color, composite colors etc. solidity when I’d use them. For buttons and leds, I decided to make my own PCB. I used Kicad, a VERY reliable “open source (GPL) software for the creation of electronic schematic diagrams and printed circuit board artwork”. I made all the components with datasheet informations in order to be sure my PCB would fit reality. I ordered PCB from batchpcb.com. They are in USA, I’m in France. It took around 3-4 weeks. Long time when you’re as impatient as me, but a correct delay considering the reliability of PCB you receive at home !!! Here are some 3D rendering from Kicad/wings3D in order to see what I expected. NB: if you checked a bit, you’ll find an error. Indeed. and even 2 errors on the big PCB… I had to re-order it in order to get a correctly done PCB. The box was basically made with aluminium corners. Even if a lot of people thinks I’m a non-finisher-guy, I have to say here that I didn’t and won’t spend (waste) time to make a perfect box! Indeed, my way is the music, the code, the design of the interface, not the aesthetic of this box! As we saw before, there are 2 CORE inside the protodeck. each core runs a particular code especially made for each function he has to provide. there are a lot of files. By doing make cleanall, and make all in at the root directory, if you have a well configured toolchain, it compiles a .hex file that you have to upload to each core. At this point, you should read a bit more about MIDI. The basic wikipedia definition can be enough here. How the differents events & messages go ? Basisally, each core send and receive midi message. Other handles manage the different inputs (DIN, AIN etc) and reacts by sending midi message to the midi ouput. The “only” thing you have to do is a mapping between physical components (potentiometers, buttons, leds) and midi messages. I had to map each potentiometer to a special midi message called Control Changes. each pot maps with a control number. always the same channel (1) is used ; so the second byte is always 0xb0. I had to map each button to a special midi message called Note On. each pot maps with a note number. always the same channel (1) is used ; so the second byte is always 0×90. I had to map each rgb led to the Note On message too. each led maps with a note number. The midi link concept is a midibox framework concept easy to understand. His main purpose is to avoid midi feedback in multiple core environment. It is very clearly explained here. So each message received by the midibox are transmitted to all the core, and each core can transmit midi messages. The challenge was to avoid that one button connected to the core1 can fire message that could be understood by core2. This was solved by using if() statements and the most nice mapping I found. (the little sign “no way” on the schematic means that if() statements stopped message that mustn’t be parsed by core2. The MIDI mapping is hardcoded in the firmware in order to make it very fast. Here is a sample of the file I used to make it. I let you read the code and the different USER functions involved inside. The dream became true when Ableton and Cycling ’74 announced together this great collaboration 01/2009. The protodeck only talk MIDI language with the external world… and it is very enough. As seen before, it responds to midi note on by lighting LED, it sends midi notes when I push a button and send MIDI CC values when I’m turning a pots. cool. Now, I need to talk with Ableton Live. This will be done with Max For Live. The Max for Live patch I use as an interface is the brain. All the logic of my live performance are inside of it. Of course, using it as-it would be stupid. It only fits with my live set, with the protodeck and with my mind. Of course, parts can be used/altered/adapted for your own use. It could be a nice way to understand what you can do with max, Max For Live & Live. When I use a potentiometers, it drives core to fire Control Change Midi events to midi out. The patch basically listen the midi in interface, and select all the midi CC events and route it to different way, ended with subpatches. Inside each subpatch, I map each value of CC sent by turning a pot with a parameter of my Live set, through the live API. They exactly fit the purpose: no undo on the values change (it is better, cause it would cause A LOT of events logged/registered for nothing, a waste of CPU time! ), and directly mapping and fast way! Buttons pressed drives core to fire Note On Midi events to midi out. Here is the whole live set. I first show some pictures, informations/explanations will come after them. protofuse’s liveset part 1 on Vimeo. The whole main tracks are 8 tracks. The first is the Drums section. It is basically a group track with 6 sub-tracks inside. There are 2 send/return channels. Each track, excepted the Drums section, contains an instrument rack with chains. Each chain corresponds with a song. Each send/return contains an FX rack with 2 chains corresponding with 2 set of effects. – all the midi messages from the protodeck comes inside the track 0 where the interface patch sits. – all the “internal” midi messages which have to be handled by the interface patch go to the track 0 too. Now, I’ll describe all the patches inside the interface patch. I try to be as clear as possible. This is the higher level of abstraction of this patch. Here I map control changes midi messages from the protodeck to the Live through the API. After that, I send the selected flow to a lot of sub-patches. The live.remote~ object is the one most used! Live.remote~ blocks mouse tweaking, but is the one to be used for hardware controller use. Here, I mapped macro 1, 2, 3 & 4 of the rack inside each return tracks. These patches controls the rate of each track audio signal sent to the 2 return tracks. These patches controls the rate of each drum track audio signal sent to the 1st return track. These patches controls the macro 1 of each rack in each drum track. This patcs controls an EQ8 on the master. All the drum tracks are inside a group track. The patch maps potentiometers with one macro per rack. Each macro controls more than one parameter. In each track, a rack with an instrument in each chain. One pots in each track controls the first macro of each rack. Here I map midi notes messages from the protodeck to the Live through the API. This patch is interesting and is used for [p sendBbuttons] & [p mastFXAbuttons] & [p mastFXBbuttons] subpatches. The concept is easy to understand: I have racks with 2 & 3 chains inside forsend A, send B & 2 differents racks in the master section. The following patch mapped 2 buttons to this behaviour. I push the first button, the chain 1 processes the signal. I push the second button, the chain 2 processes the signal. This is a toggle behaviour: I push/release, it is enabled. I repush/release, it is disabled. This concept/behaviour is all the same for [p sendAbuttons] & [p sendBbuttons] & [p mastFXAbuttons] & [p mastFXBbuttons] subpatches. This patch activates/deactivates the autofilter in a track. Each track includes an autofilter. This patch basically mutes/unmutes each track. This patch basically mutes/unmutes each drum track. Each sub-patch observes things and much more. I light on/off some leds and it is made automatically when status change. It observes the state of basic filter in each track. If a note is played in one track, a little green blink occurs. If the track is muted, but a clip is playing notes, these blink are red in order to make me know the track is playing but muted. The noteDetector is a basic abstraction I created to fit my need. The blinking feature SHOULD be implemented in the protodeck firmware. I didn’t do that even if I have the C code. It tranforms the protodeck in a pretty christmas tree. one message midi note per led to switch off all leds……….. It observes drum group 3 FX. A note with a velocity of 1 means the considered FX is off, 127 means on. The firmware can translate it in a special character on the LCD. It sends messages directly to the script. I would need other informations too like some level in dB info etc. The most interesting thing isn’t the LCD itself or the interface with the core. It is the high-level part of the protocol I use. For instance, to update the song number to the protodeck, I send a little midi note message with a defined pitch (here: 123) & as velocity, the song number. At init time, I send the number of song by sending another special midi note.